little nails shows us her Dressed Up Stripey nails. Lawless Lacquer swatches Jessica Cosmetics It's a Girl Thing spring 2012 collection. Beauty Junkies Unite swatches China Glaze Glitz-Bitz n' Pieces collection. All Things Beautiful swatches new Maybelline Color Sensational Vivid Lipsticks. Polish All the Nails shows us her glitter rainbow zig-zags nails. Amber Did It shows us her Pure Ice My City entry. Polishy of Truth swatches Elevation Polish Urban Elevations collection. XO, Noelle swatches Pure Ice Holiday polishes. Lit from Within swatches some Enchanted Polish polishes. Manicure Description: Colours used-China Glaze Shower Together, China Glaze Sea Spray & Lotus Herbals Perfect Peach Used French manicure guides to create the stripes. 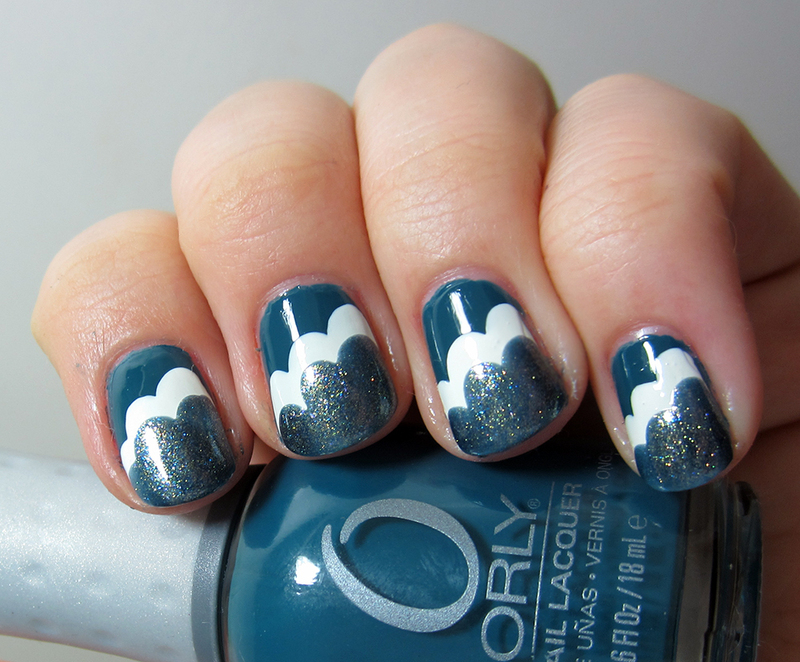 Manicure Description: One of my first attempts at a cloud manicure and I'm quite pleased with the result :) Orly's Sapphire Silk, China Glaze's Snow and OPI's On Her Majesty’s Secret Service were used. Favorite Polishes: Barry M's Blood Orange, China Glaze's Midtown Magic and Color Club's Revvvolution.